AIM: To provide an environment that will enable children to reach their full potential in the area of physical development. 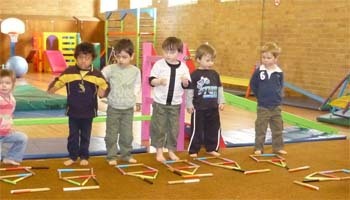 Leaping Lizards provides a program specifically designed to enhance the child’s physical development, complimenting the kindergarten’s role in providing an environment to stimulate the child’s cognitive and social/emotional development, so that on entering school their skills in all areas will be age appropriate. 1. Free Play - time for the child to enjoy the equipment and/or toys with his friends or other children in the class and to practice new found skills. Children often find this an opportunity to challenge themselves, develop social skills e.g. sharing and composing their own games etc. in a safely supervised environment. 2. Sticks - Tapping sticks to music to develop eye-hand co-ordination, visual and auditory processing skills, body and spatial awareness, concepts and rhythm. - After the music activity children use the sticks to develop different age appropriate skills; recognition of colours, numeracy, shapes, spatial concepts, fine motor and auditory skills. As the term progresses skills are consolidated and expectations become more challenging. 3. Animal Recognition - children are stimulated with simple animal knowledge, visual memory skills, finger dexterity, auditory memory, language skills and develop the skill of deductive questioning. 4. 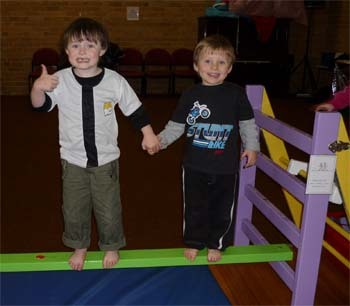 Climb - A different combination of challenges on the ladders, a slide, mini trampoline, bar, beams and planks. 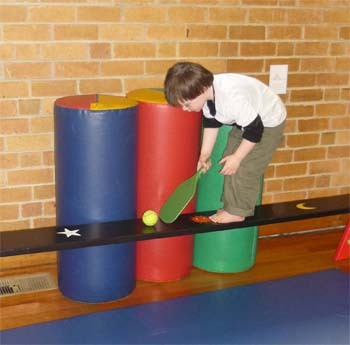 On selected pieces of equipment children are encouraged to make their own choice whether it be adapting a skill or inventing a new way to use the equipment. The climbing enhances muscle tone and strength, balance, spatial and body awareness, gross motor, concepts, motor planning and climbing safely. All the children take turns at being the “leader” which aids in developing their self-confidence. - Coping with being jostled i.e. in group activities, tiggy games etc.